With in excess of 5 million annual visitors all looking for things to do, Phuket attractions have a lot of people to please. There is a large variety of travelers that visit the island. Keeping all these people entertained is no mean feat. Phuket isn’t Thailand’s most visited island by accident. The island has evolved a lot over the last few decades to cater for them. 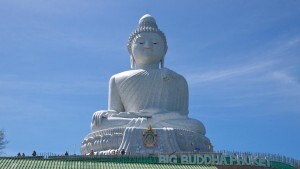 The vast and varied number of attractions means that visitors are never stuck for things to do in Phuket. The quality and standard varies greatly so let us take the stress out your trip and help you find the best Phuket attractions. No matter what you are looking for from your travels Phuket will offer something for you. Great for families, activity seekers, nature lovers and cultural enthusiast alike the island has it all. The cost of Phuket attractions varies greatly not just from venue to venue, but also from ticket vendor. We would strongly recommend purchasing your tickets from authorized agents such as Expedia. The Thai culture is very diverse and rich wherever you visit but none more so than the island of Phuket. Situated on a main shipping route the culture here as evolved over the last few centuries. If cultural attractions are what your after, then there are 3 main temples on the island which are worth a visit. The main one being Chalong temple (Wat Chalong). Most of the temples are open to visitors and can be busy during the middle of the day. When ever you visit a religious site please be respectful by dresses and acting appropriately. 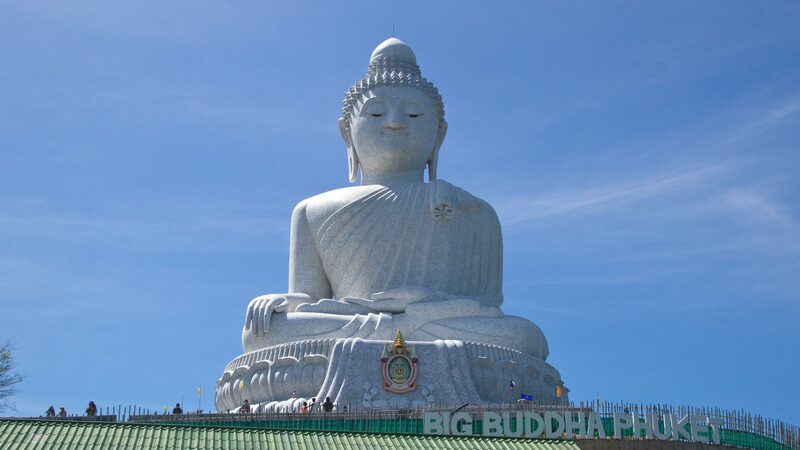 Another cultural attraction which we consider a must see sight is the Big Buddha, this 45 meter tall statue is awesome sight. The Buddha and the surrounding grounds are free to the public and open every day. Phuket is the perfect island to visit with your family, and you’ll be spoiled for choice when keeping the young ones entertained. Whatever type of attraction your family enjoys there will be something here for you. There are things to do for all ages from toddler to teenager. Children are welcome at most attractions on the island. We all know traveling with families can get expensive but there are many things to do for free or on a budget the whole family will enjoy. Try snorkeling in one the many secluded bays, or visiting the temples or visiting the national parks. Phuket is a lush green mountainous island which is covered in dense rain forest. Thanks to the protection of national park status much of central Phuket is unspoiled. Wildlife and flora flourish in the parks and if you a fan of nature you will surly want to head to one of the parks. Tours into the jungle can be arranged from your hotel or local agent and can vary from half a day to camping overnight. We don’t really recommend venturing to far into the jungle without experienced guides. The waters around the Phuket are also a protected national park and these offer a wide variety of tropical fish and corals. If your a diving enthusiast or thinking of learning then these waters are perfect for you. 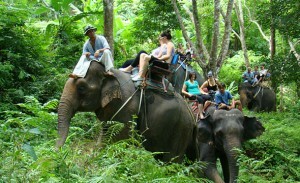 One of our recommended tours is trekking through the jungle by elephant back. If your the sporty or active type then Phuket will cater for you. The island is a much loved diving destination for both experienced and novice divers alike. A lot of the beaches and bays are well protected and the waters are calm making them safe for all ages and abilities. For those who don’t quite fancy the full on experience of diving then the snorkeling here is pretty good too. Some of the larger more popular beaches offer a variety of water sports such as jet skis, pedalos and paragliding. Phuket is also a favorite for rock climbers and offers opportunities both indoors and outside. We only suggest the outside climbing for those that are highly experienced. Many of the visitors will also want to experience one of the boat trips to around the marine park and visiting the nearby islands such as Phi Phi and James Bond Island.